Jat Tehnika proudly announces opening of the new Jat Tehnika Line Station in Krasnoyarsk (Airport KJA), Russia. The station is operational starting from 01st of May 2011. 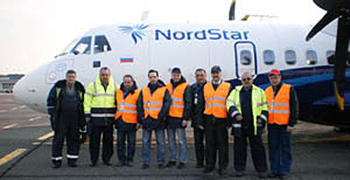 Jat Tehnika provides line maintenance services for Taimyr Airlines (www.taimyravia.ru, brand name NORDSTAR, www.nordstar.ru) new fleet of four ATR 42-500 as part of technical support project from airplane manufacturer ATR (http://www.atraircraft.com/newsroom/press-releases-details-1137-en.html).